Shown above is a Siemens 'Sieray' 125W high-pressure mercury vapour lamp, probably of 1950s or 1960s vintage. This type of lamp is highly energy efficient, was used for street or other outdoor lighting, and gave a harsh bluish-green-tinted light. The inner bulb is fused-silica for high-temperature operation. The outer bulb serves as a filter to absorb most of the harmful UV content (objects placed near to the lamp do not fluoresce); but note that the high-pressure Hg discharge has more visible and less UV-C content than it's low-pressure counterpart..
on clamp around pinch stem: 5964. The tube is designed for 230 V AC mains operation via a ballast choke. Starting is accomplished by having a priming electrode, which is close to the main electrode at one end and connected via a resistor to the electrode at the other end. The small gap creates a field of sufficient volts / metre to start a local discharge. This causes ions to bombard a coiled oxide-coated (Wehnelt) cathode and therby produce thermionic electrons. The electron emission in turn causes ionisation of the bulk gas, and the glow spreads throughout the tube by an avalanche process. Note that, since the tube is intended for AC operations, there are oxide-coated cathodes at both ends. A test circuit used for obtaining the DC characteristics of the tube is shown above. The tube starts readily from a 325 V DC supply (i.e., 230√2 V) provided that the electrode closest to the priming electrode (the tip connection on the end-cap) is used as the cathode (-). The minimum striking voltage is about 155 V. A ballast resistor is of course essential. For the preceding photographs, a ballast of 5.5 kΩ was used. This gave a tube current of 45 mA, and a running voltage of 53 V (2.4 W dissipation). Hg - Ar. The black deposit, particularly visible at the trigger-electrode end, is the mercury supply. For the photograph of the working tube, a thin pile of photocopier paper was used as background. Such paper will fluoresce brightly when illuminated by UV light. The Sieray lamp did not cause it to fluoresce noticeably, indicating that the outer glass bulb absorbs most of the UV. The negative resistance characteristic of the gas discharge is evident from the following DC measurements, which were obtained by varying the supply voltage and using different combinations of ballast resistors. * no, I don't intend to test it at full power. The lamp is shown below illuminated using a coil self-resonating at about 21 MHz. The coil is suspended from a length of fishing line. The lamp electrode furthest from the connecting cap is grounded (via a laboratory clamp) to the outer of one of the BNC connectors feeding the induction coil. The other electrode is connected to one end of the coil by touching the coil onto the tip contact. 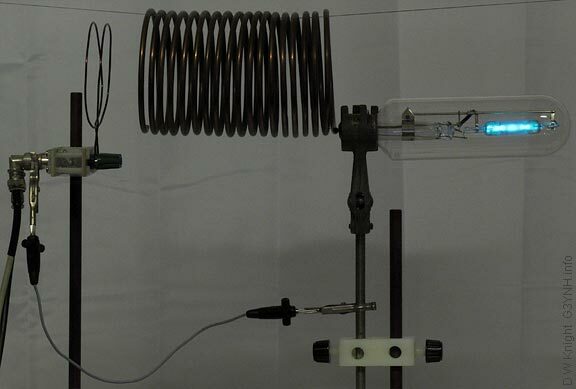 See inductor resonance experiments for more information on the setup. Above: The RF discharge at 21 MHz.